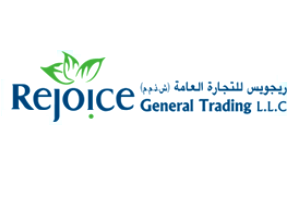 Rejoice Group is a young dynamic business group in UAE, with significant involvement in Food Distribution, International Trade, Building Material Trading, Electricals, Navigational aids, Instrumentation, Industrial and Oil field Supplies, Machineries and Material Handling equipments, Safety Products, Raised Flooring, Indenting and Corporate Services. The Rejoice Group has always adapted to free-market reforms moving quickly in new markets that have opened, and capitalising on new opportunities. As a result, the Rejoice Group has now strategically positioned itself to contribute to sectors such as Food, Import & Export, Indenting, Construction Materials Trading, Industrial Consumables Marketing, Liaisoning, Agencies etc. Mutual trust and co-operation are emphasized as key organizational guidelines. At the same time, sound modern management practices are given primacy within the Group and also at the corporate level. Rejoice Group prides itself on its business ethics and strong values. Copyright ©2016 Design People LLC.